or other yummy vegan treat. “So what do you eat?” and “How do you get your protein?” are questions I get a lot. So, I thought I’d share some yummy food to show you just how versatile and healthy vegan eating can be! 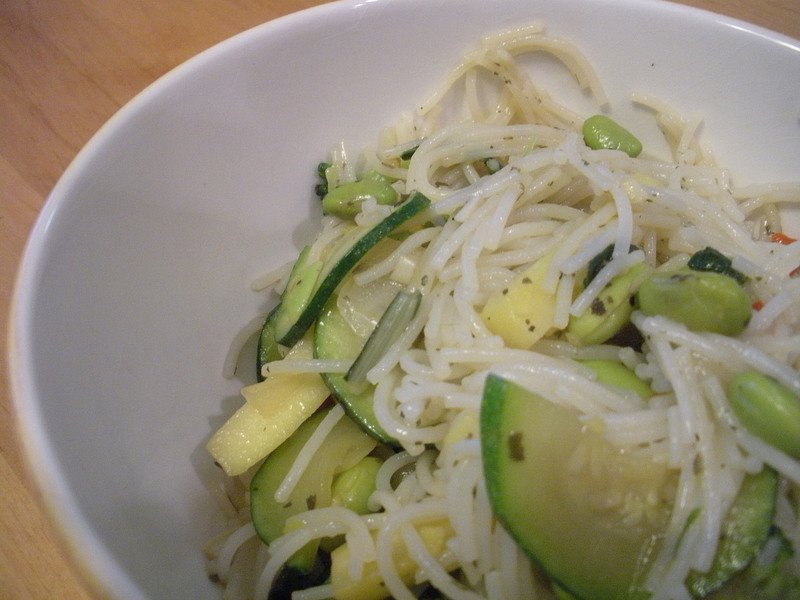 Tonight I made Rice Soba Noodles with Tea Spice Veggies. Note: Use whatever veggies you feel like – clean out your fridge, that’s what I did! Mix all ingredients for the sauce in a bowl and set aside. Boil rice soba noodles according to package directions. Avoid cooking fully – remove from heat when nearly cooked but not all the way. In the meantime, add 1 T safflower or some type of stir fry oil to a wok or pan. Add veggies to wok/pan and cook for about 3 minutes. Add half of the sauce to veggies. Remove veggies from wok/pan and add 1 T safflower oil to the pan again. Add noodles to pan and stir around. Add rest of sauce. Add veggies back to pan and heat through. I served this with steamed bok choy that was drizzled with balsamic vinegar and roasted pumpkin seeds (more protein. YAY!). Did my kids eat it, you ask? Well, they love the Tea Spice on the noodles, but they actually prefer their veggies raw. So, I served them a bowl of the flavored noodles with raw carrots, spinach, apples, and pumpkin seeds. I figure as long as they get their veggies, it doesn’t matter to me how they get them. Dave and I loved it! This entry was posted in Dinner recipes. Bookmark the permalink. Announcing….drum roll please…..my NEW blog at at NEW location! Announcing....drum roll please.....my NEW blog at at NEW location!